This week’s Project 52 hasn’t been that riveting. Just school and work, and a flexi day off for me – unfortunately wet, windy and cold. So I didn’t even get to do my original plans. On Sunday N went for 2 hours of tennis. There were some level 1 tennis coach assessments going on and they’d asked for some mini red players to be ‘coached’ for them. It gave use parents 2 hours to go and do things when usually there’s not really enough time. N loved it, and all the children seem to worship the older teens. Plus N got to play with 2 of the older orange children as well as his usual doubles partner, so he was very happy. Monday was just back to school and work, and Tuesday the same. This week has been a real palaver though as I’ve spent 3 evenings on the phone trying to sort out the OH’s mobile. It should in the end make his contract easier to deal with. His mum set up the contract before I was around, It’s always hard making any changes because the OH won’t sort it out himself. Back in February I went into store, got them to cancel the old contract and set up a new one under my account, with the intention to move it into the OH’s name and direct debit asap. All fine until it came to switch his number because he wanted to keep his old one. Which seems to be a real issue moving monthly contracts with the same supplier. Sigh. It’s been very painful – with only moaning from the OH about him having a phone that’s not working. If he would just do it himself. I should have just cancelled the old contract, then set up one in his name online. By Friday and another call it was fixed and working, now just to change over the direct debit so he’s paying. On Wednesday, more of the same, although trying to reassure N that he can do maths. He had a serious crisis of confidence this week which appears a bit strange. Even his teacher was surprised. He also auditioned for the key stage 2 summer performance. I’m presuming for the chorus/company. I’m glad he’s made the effort and wanted to be involved. He also didn’t seem phased by having to read a Revolting Rhyme out for the audition. On Thursday I had a flexi day. My aim had been to go to Cheltenham but the races were on, so decided on Oxford. I got absolutely drenched despite having an umbrella and had to buy new trainers because my boots now give me blisters and let in water. It was a day that involved lots of coffee shops, and a new pencil case for N from Smiggle. Thankfully on offer. Friday I was back into work and N was at school in red for Comic Relief. He had a good tennis session – they had an extra coach so the larger combined group was again split back off. Phew. Plus it was the coach he has for his private lesson at school, so it’s nice for him to have consistency. They also now have their team place in the summer league. I’m doing the team captaincy so I’ve been trying to get organised with that, reading the rules and contacting opposing teams. Saturday has been a catching up day. Swimming lesson this morning went well. N’s group had more length of the pool than normal, so they swam a lot further which is great for building up their stamina but really tiring for little arms and legs. They did a lot of breast stroke practising arms and getting higher in the water. Then a few lengths of butterfly doing just the kick, then adding one arm then attempting 2. Adding the arms is definitely hard and something that’s going to take N a bit of time. But he’s got the body and leg movement well. We lazed for the rest of the day, inbetween doing wash loads, clothes folding, unloading dishwasher, baking scones and a food shop. This week’s photo was taken in Oxford – a reflection after the rain stopped. 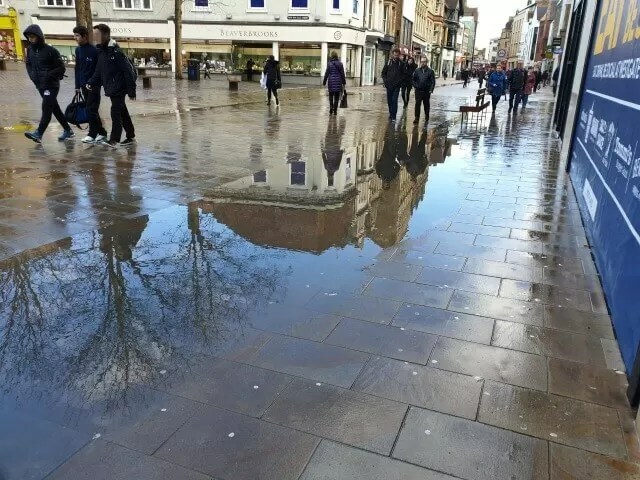 Love the photo – reflections in the puddles always fascinate me. Sounds like you had a busy sporty week. Hope the maths crisis won’t last long, and N will regain his confidence. love the photo, it’s a great reflection. Glad you’ve sorted hubbies phone out, things are never easy are they? Your photo pretty much reflects most of the week here…lots of rain! so the rain serves a purpose……makes for fab photos. I could never master the butterfly arms either, I just ended up half drowning myself trying, but swan the other 3 strokes for the school swimming team when we lived in Berlin. A chilled afternoon sounds like it was needed. It has been so wet this week. I popped out for 5 minutes and spent over a day trying to dry my boots out. Glad the tennis has been going well this week. I am the same as you, work and school fills our weeks. Sounds like he did well with the swimming and tennis this week. Great news on the audition too! I didn’t realise they did auditions for these sorts of things! That’s a fantastic photo. It sounds like tennis is going really well for N. Sorry to hear about his maths crisis. Hopefully it will just be a blip.